In the midst of one of most severe winters I've ever experienced in the New York area, and with just a month to go before St. Patrick's Day, my thoughts go back to the summer sun and fun of Ireland! OK, maybe that's not the destination you might associate with sun. But I'm here to say that's what I experienced last year during a quick five-day trip to Ireland. Last summer just happened to be the hottest and driest summer in years in that country. Indeed, everyone that I met in Ireland kept reminding me that it is usually rainy and even a bit cold, so don't expect the sun to continue. I mean, who in their right mind tells tourists to expect rain and cold in their country, even in summer? The answer, as I know now, is the Irish! For me, I kept saying to my new Irish friends that I would be describing their country as the new "sun and fun" vacation spot. I told them they were just trying to keep their paradise to themselves. Of course, with sun and fun goes some hardship. One thing Ireland does not have is air conditioning, which makes for somewhat "hot" accommodations even in the most luxurious castles and hotels, as I detail below. Another thing Ireland doesn't have is reservoirs. So after many weeks of sun and no rain, the country was actually experiencing a drought, something that I was told just never happens in Ireland. CIE Tours International CEO Brian Stack had always told me that if I ever went to Ireland I should get in touch with him to arrange a visit. CIE is known for its escorted tours of Ireland, but it also offers private guide and driver programs, which is what Brian organized for me. Brian put together a western Ireland program that began in Galway for one night, moved to the famed Ashford Castle for two nights and then ended in Dromoland Castle for two nights, before I headed back to New York from Shannon Airport. Galway proved to be a wonderful place to start the journey since it's one of the "youngest" towns in the European Union (based on the age of residents and visitors) and is also a great place for music and pub crawls. We stayed in the Hotel Meyrick, a classic old railroad hotel with the antique decor and hospitality to match. In the long summer evenings, where it’s light until well past 11 p.m., we strolled along Quay Street, which is full of pubs, restaurants and shops. There are also plenty of outdoor free music performances and other entertainment. 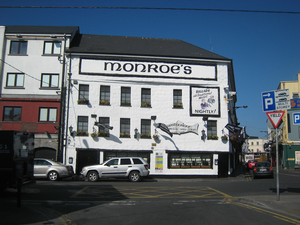 We also spent several hours listening to music in Monroe’s Tavern. 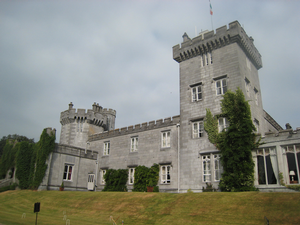 The next day our CIE driver and guide picked us up in a small van to take us to the famed Ashford Castle, a luxury 83-room hotel located on a lake near the village of Cong in County Mayo. With its classic turrets, towers and gates, Ashford is an impressive sight. 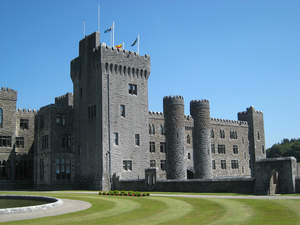 PHOTO: Historic Ashford Castle offers luxurious accommodations and lots of activities. The castle also just happens to be where the famed John Ford comedy “The Quiet Man,” starring John Wayne and Maureen O'Hara, was filmed back in the early 1950s. Indeed, the cast and crew stayed in the castle and the entire area is full of locations where the movie was made. That movie might not be as well known today, of course, but the castle has other charms and activities that make it a destination resort. There’s a golf course, two restaurants (including a main formal dining room), a wonderful lounge where you can have tea, a spa, and acres of green grounds and forest to explore. There’s also horseback riding, falconry, a boat ride to a nearby island in the lake and a short hike to the picturesque village of Cong itself. I guess the only downside to our stay at Ashford was the summer heat. You see, Ashford, like most accommodations in Ireland, has no air conditioning in its rooms. Indeed, in most years air conditioning is not necessary anywhere in Ireland. Our suite, complete with four-poster, canopied bed, was wonderful. But we had to make do with an old fan to help reduce the heat a few degrees. Of course, that’s all going to change very soon. Ashford is now part of Red Carnation Hotels, which is investing $25 million into the property to upgrade its rooms, public spaces…and add air conditioning. Ashford by itself had enough to do during our two-night stay, but we also were in Ireland to explore more of the countryside. So with our CIE driver/guide, we explored much of the western part of the country, driving down narrow lanes to quaint villages, through beautiful green countryside, past massive mountains and around inlets and fjords. We took part of one day to explore the iconic Cliffs of Mohr, a truly remarkable natural monument on Ireland’s west coast. You can truly spend hours hiking on the along the cliffs and taking hundreds of photos. After staying two nights in Ashford, we took a relatively short drive to our next destination, Dromoland Castle. On the way, we stopped at historic Bunratty Castle, a great medieval castle keep with wonderful views of the surrounding countryside. The adjacent Folk Park, great for families, offers examples of buildings in a traditional Irish village and farm. PHOTO: Guests at Dromoland Castle can take advantage of great dining and beautiful gardens. Dromoland itself is also an impressive castle with some wonderful flower gardens, a golf course, and a smaller lake. We took bike rides around the lake and enjoyed walking in the garden. We also enjoyed the elegant restaurant as well as a more casual option near the garden. Better yet was the fact that our suite actually did have air conditioning, which made our stay much more comfortable. The castle was a great way to end our all-too-short five-day journey through Ireland. We still need to get to Dublin and much of the rest of Ireland. But at least now I can tell my Irish tourism friends that I have sampled their great country. 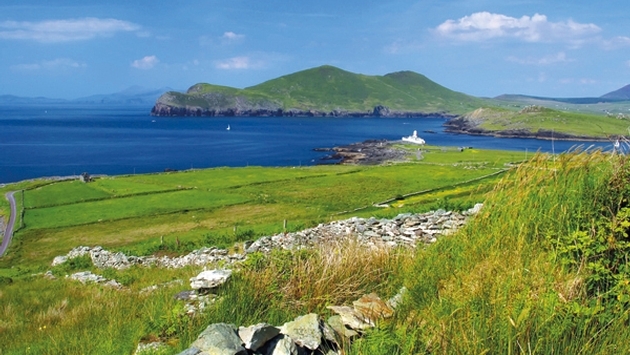 Indeed, it’s only inspired me to return as soon as possible to explore even more of Ireland.